I need help with planning a four or five nights trip into "The Outback". We are an energetic couple 56 years old (a young 56). We love photography, camping, and we are not into 5 star hotels. We are also trying to plan our Australia trip on a budget. We will be arriving on March 16, and leaving morning of April 2. Most likely this will be our only trip to Australia, as we have lots of other places to visit. This is what we have tentatively planned: 4 nights in Sydney, 4 nights in Cairns, 4 nights in "The Outback", then fly to Melbourne and continue travelling there. We have one extra night, and I am trying to decide on an extra night in the Outback (1 night in Alice Springs, 2 nights at Kings Canyon, 2 nights at Ayers Rock, we want to do a lot of scenic photography), or a day tour from Cairns to Port Douglas, Daintree & Cape Tribulation. The original plan was a 5 day camping safari in the outback, but I think I would like two sunsets at Ayers Rock, and they only spend one night. Since then, I have been reading more about CapeTribulation, Daintree and Port Douglas, and think it would be nice to get a "peak"of the area. I am also debating on renting a 4wd or taking tours. I do not want to be confined to a tour bus. We REALLY want to rent a vehicle in the outback, but were wondering if we would miss the info that the tour guide would provide, and are also concerned about getting stranded without gas. What are your thoughts on renting a "campervan", and do we need to reserve campgrounds? I don't mind staying in a campervan, cabin, floored tents, but am a little concerned about the danger of just pitching a tent somewhere. Any help you can give would be appreciated. "We have one extra night, and I am trying to decide on an extra night in the Outback (1 night in Alice Springs, 2 nights at Kings Canyon, 2 nights at Ayers Rock, we want to do a lot of scenic photography), or a day tour from Cairns to Port Douglas, Daintree & Cape Tribulation." You need to consider how vast all the distances here are. I understand that on your only visit to Australia you want to see as much as possible, but your whole schedule sounds very hectic to me. Cape Trib is lovely. If a peak is satisfying for you I'd do that. If you want a less hectic trip and a deeper experience, skip it. Your 5 nights in the centre schedule sounds very reasonable to me. "I do not want to be confined to a tour bus." Frankly, the only way to avoid being confined to a tour bus is to not go on a tour. Camping safaris will still confine you to a tour bus for most of the time and they schedule your day (which means limited time and opportunity for photography). The only difference to coaches is that the bus is smaller, the group a lot younger, and that you'll be camping outside at night. "I am debating on renting a 4wd or taking tours." The roads are all bitumen, rather busy, and there are service stations at Uluru, at Kings Canyon, and three more on the way from Alice Springs (and people and shops and facilties and, and, and...) You really don't need to worry about runnig out of gas or running into trouble. Honest, that area is so touristy, you'll never be alone. There is nothing to worry about. If you love camping and don't like tour buses, by all means get your own vehicle! "We were wondering if we would miss the info that the tour guide would provide." That is a valid point. However, depending on the tour you may get a great guide who does have a lot of knowledge, but you could also get someone who is bluffing his/her way through a lot. (Yes, it does happen.) It depends on the company, I guess, but I can't give specific advise here. I really wouldn't know. "Do we need to reserve campgrounds?" No. Between June and August I'd try to make reservations, mainly in Alice Springs. (I'm not sure you even can reserve camp sites at Uluru or Kings Canyon.) But it's definitely not necessary at the time of the year you'll be there (March). "What are your thoughts on renting a campervan?" Renting campervans is expensive, and since you travel to places that have excellent facilities I don't see much of an advantage. You can rent normal cars plus camping equipment in Alice Springs. That seems to make more sense to me, especially when you are on a budget. Campervans are great for longer trips, remote areas, or people who prefer to stay away from campgrounds, but in your case I don't really see the point... But then again, look around at the possibilities and prices and decide just how much you want to rough it. "I don't mind staying in a campervan, cabin, floored tents, but am a little concerned about the danger of just pitching a tent somewhere." I'm not sure what kinds of dangers you are concerned about. You can't pitch a tent just anywhere in that area. You will have to stay at the Ayers Rock campground and at Kings Canyon campground. There is nothing to fear there. Ayers Rock campground has floored tents, and there are some affordable cabins at Kings Canyon (with shared bathrooms and camping kitchens). There's nothing dangerous about pitching a tent, but if you've never done it that way I can understand your reluctance. Relying on on-site tents and cabins etc. will save you time you'd otherwise spend unpacking and packing up again, and also offers a bit more comfort. I'd check into prices for the floored tents and cabins at Uluru/Kings Canyon, and the prices for campervan vs. normal car, and see what's more economical. Keep in mind that the campervan will also require a lot more fuel. You will be driving well over 1500 km/950 miles. Also consider that it can get quite stuffy to sleep in a van on warm nights. Well, that's all I can think of telling you for now. Feel free to use the comments section if you have further questions. I hope that you will have a fantastic trip and will return with many wonderful photos! Thanks for your input! It has been very helpful. We have decided to give up the trip to Cape Trib & go on to Alice Springs. P.S. The sunset photo by Patrick is great!! I'm sure your photos will be, too. You're more than welcome :-). Given your limited time that's a good decision. And I'm sure that the photos you'll bring back will be great, too! I have hired a campervan while visiting WA you should be aware that most of them do not cover you driving off bitumen road surface this is very limiting as many intresting places are on safe , graded but unsealed roads, in my opinion a car and a tent is much more versatile. There are a lot of natural wonders around Alice. Then there is the school of the air,the flying doctor service both well worth the visit. I would consider spending an extra day there. Enjoy your trip. Also be careful if you rent a 2wd car that the firm allows off bitumen use. Many in Alice do not but I don't know about elsewhere. Join in and write your own page! It's easy to do. How? 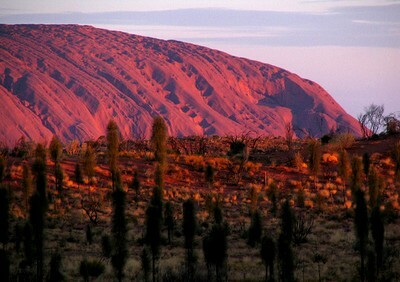 Simply click here to return to Ayers Rock Australia - Uluru Australia. !! Free Outback Guide !! Copyright © 2005- Birgit Bradtke. ALL RIGHTS RESERVED. This site uses Australian English, because that's what Australians use. Words like for example "travelling" or "colour" might look unfamiliar to you.